Stones helped farmers weigh and score livelihoods asset indicators (image Credit:ILRI\Simret Yasabu). 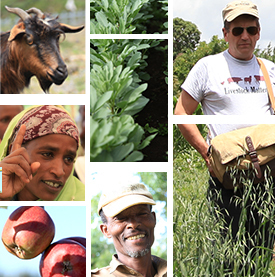 From 19-25 May 2013, the Africa RISING project in the Ethiopian highlands carried out livelihoods survey in the eight research sites/kebeles in four woredas (Goshe Bado, Gudo Beret, Salka, Ilu-Sanbitu, Jawe, Upper-Gana, Emba-Hazti, Tsibet) in Amhara, Tigray, Oromia and SNNPR regions. 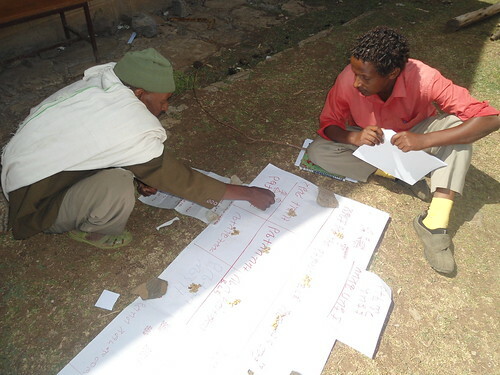 150 farming households participated in each woreda; from each woreda, 30 farmers identified their livelihoods asset (natural, financial, social, human and physical) indicators for their respective kebeles; the remaining 120 were involved in individual household interviews. The composition of the sample households were representative/heterogeneous/diverse in terms of wealth (low, intermediate and better off households), gender (male and female), age, leadership of the household (male headed and female headed) and location within the Kebele. The surveys were carried out by people drawn from agricultural research centers, universities and woreda bureaus of agriculture. The results of the survey are now being entered in SLATE tool for further analysis and reporting. Tags: slate. Bookmark the permalink.